IWM rose by 1.3% this week, while my account rose 1.6%. The loss-floor has risen to -2.9%, its highest value since last May. US markets were closed on Monday for Presidents’ Day. On Wednesday around 4:20pm, Yahoo! 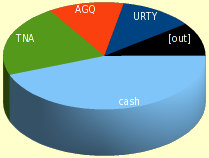 Finance was offline, so stop-updates for URTY and AGQ did not happen. Yahoo came back an hour later, but the stops wouldn't have changed much anyway so I didn’t bother rerunning the update. URTY: On Friday, the robot set the stop loss to +0.5, but my manual calculations came out to +0.8. I raised the stop manually, but this needs investigation. Tuesday night, the robot generated a “buy” signal for UWM, but the signal was invalid because SMA(q) was less than CHANDELIER(+) so if the order had actually filled, it would have immediately stopped out. I added a new rule: “do not buy if limit-price is less than stop-price”. The new rule prevented a buy-order Wednesday night, but there was a valid “buy” generated Thursday night, which did not hit its limit during Friday’s session. There is another ”buy” order for Monday.